On Monday the 6th of November, The United Nations opened the doors to its yearly event (this time round in Bonn) in an aim to bring together the world’s nations and discuss plausible solutions to the implementation of the 2015 Paris Agreement and how to tackle one of the most pressing issues of our times: climate change. The election of Donald Trump into the highest office position in the world can certainly be likened to a Tipex spill on the tireless work of lawmakers, activists, environmentalists and quite literally anyone working towards tackling climate change and creating a cleaner, greener planet. Within just a few months as President, Trump withdrew the participation of the US from the Paris climate accord – not only lifting the restriction of the use of oil and coal in North America, but also setting an example of recklessness toward the urgency with which the issues of climate change so desperately need to be addressed. 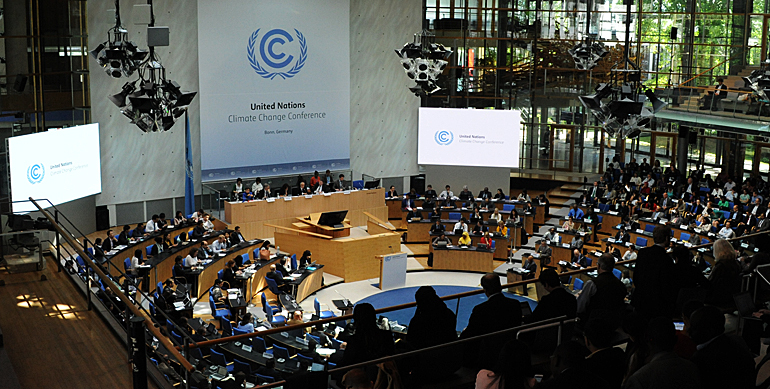 The two-week meeting will be the first to take place since Trump has taken office, and this year, the COP23 won’t only have to tackle the cause and consequence of the recent climate disasters that have affected our planet; the summit will also need to once again battle for the legibility of climate change all together – a dispute that we all hoped was coming to an end when 200 countries came together in the signing of the Paris Agreement only two years ago. Almost half as many delegates from last year will represent the US in this year’s COP23. Rex Tillerson, former Exxon CEO and now Secretary of State, who runs the department that houses the delegation, will unfortunately yet unsurprisingly not be present at the meeting. Furthermore, and most importantly, this time around the White House said it “will promote coal, natural gas and nuclear energy as an answer to climate change” through a presentation on November 13th, titled ‘The Role of Cleaner and More Efficient Fossil Fuels and Nuclear Power in Climate Mitigation’, the New York Times reports. With the US showing no interest in leading, nor participating, in the global fight against climate change, this year has seen China and India step up, despite having previously argued that their developing countries are reliant on the use of gas and coal to sustain their growing economies. As the world’s second largest polluter and richest nation, it’s undoubtedly crucial the US isn’t isolated from the fight against climate change. Yet, it’s absence in the conversation since earlier this year has, in turn, allowed other nations to play a larger global role, and independent companies operating within the US, as well as States who are committed to transforming into green States, are all beginning to act autonomously; and that, in itself, is something to be celebrated. A place for developing countries to have seat at the table is perhaps the only way we can move forward in battling climate change and turning our planet greener. We need to make room for the countries that have suffered the most from climate disasters while contributing to it the least. Perhaps the absence of the US will indirectly produce unexpected progress. What is certain is that China and India’s sudden leading roles as well as Fiji and other small and developing countries shows the world can unite without those who have led it for far too long. “In practice, the Bonn meeting will serve as a litmus test of how the rest of the world plans to stand united [without the US] and to keep the spirit of Paris alive.” Says the science journal Nature. I couldn’t agree more. Recommended: If you’d like to gain indepth knowledge about this issue read our comprehensive dossier on climate change and divestment.